There are no tables at Noren, a Japanese cantina in Montréal's Plateau neighborhood. There are no reservations, there is no way to order takeout and, on this particular Friday evening in August, there was no manager or boss in the petite restaurant. Four workers shared the tasks of seating customers at countertops, taking orders, pouring drinks, making food, serving and washing dishes. Yet, with the exception of the air conditioner that hadn't quite kicked into gear, everything was running as intended — smoothly, even. All 12 seats were taken, and at 6 p.m., there was already a wait. The restaurant's specialty is takoyaki: a creamy fritter, known as a beignet in Québec, that's traditionally filled with octopus. It's the signature snack food of Osaka, Japan, and at Noren, it's worth waiting for. 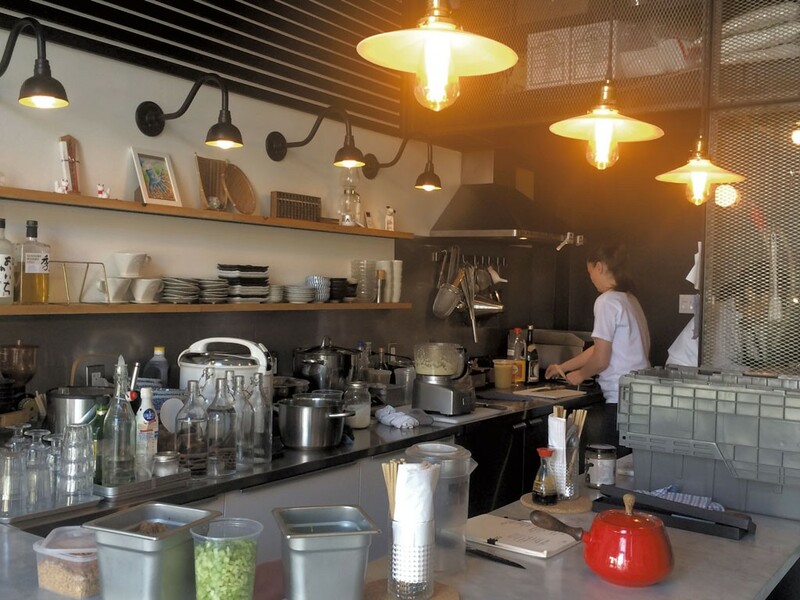 Noren, which opened in June 2016, is owned by Elyse Garand, 32, who grew up in Montréal and lived in Japan for seven years, and her husband, Hidenori Tsuda, 40, who comes from Kyoto, Japan. On an extended vacation in Japan, the owners were unavailable for an interview for this story. They were also out of regular contact with their employees, whom they trusted to run the restaurant in their absence. One of those employees is Sloane Lamarre, 32, who said that Noren's workers and owners are "very, very close." Lamarre even met Tsuda's family on a trip to Japan this summer. During a previous visit to Noren, I'd seen workers taking turns tending a baby while eating their lunches; who the parents were wasn't immediately clear because everyone pitched in. The cantina's setup and size keep its production side highly visible. Aside from a few at the window counters, most of the seats line a counter that makes a 90-degree angle around the work space, where the bar, prep area, kitchen and dishwashing sections seamlessly flow into one another. Except for the portions, everything about Noren feels intentionally small. 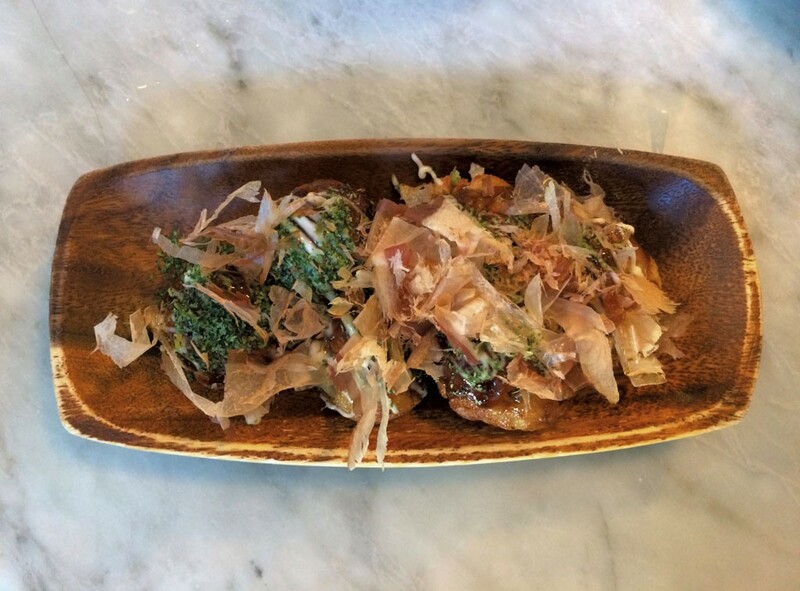 There are only three plates on the menu: the aforementioned takoyaki; okonomiyaki, a sort of savory egg pancake; and a plate of the week. The first two come with an assortment of sauce and filling options, and rotating sides sometimes appear on the menu. We ordered nearly everything, an affordable feat for a group of four when most menu items range from $8 to $12 CAD. I have been haunted by Noren's takoyaki since first trying it a few months ago. Splitting an order of six with a friend, I'd learned that a mere three would leave me yearning for more, no matter what else I ate. My longing for the fritters' comforting creaminess was only amplified by the restaurant's two-week closing just before my most recent visit. To make sure we each had enough, our group selected two orders of classic octopus takoyaki with traditional toppings and one of cheese-filled takoyaki, all at $8 per order. Takoyaki's flour- and egg-based batter typically includes dashi, green onions, small pieces of octopus and pickled red ginger. We watched the staff pour and turn the round fritters in well-oiled cast-iron pans on the small gas stove. Fresh takoyaki is beautiful to regard. Coral-hued bonito flakes danced on top of ours, the tissue-thin fish vivified by the heat radiating from the crispy treasures below. We heeded the server's warning that the dish was steaming hot and waited until the dancing subsided before devouring the classic-style takoyaki. A perfectly crispy outside yielded to a creamy, umani-packed interior, where scraps of tempura complemented the firm octopus. The salty takoyaki sauce, mayonnaise and bonito flakes were a flavor boon to the crisp outer layer. The cheese takoyaki was also excellent, with white cheese melting into the creaminess of the beignet. We chose this one topped with spicy mayo, so it was salty, creamy, savory, crispy and spicy in one magical bite. Group dinners tend to increase my usual Midwestern politeness, but when a friend offered me the last takoyaki, I promptly took it without offering to split. Noren's cheese takoyaki could rival poutine for the top spot in the pantheon of late-night food, if only the restaurant stayed open past 9 p.m. I found Noren's takoyaki more flavorful than those of nearby Ichigo Ichie and Ramen-Ya, which have similar but wider offerings. Perhaps Noren's smaller scale and conscious sourcing help the food taste fresh. Lamarre said most of the restaurant's meats, eggs and vegetables come from local organic suppliers, though some specialty items, such as octopus and yuzu juice, are imported from Japan. 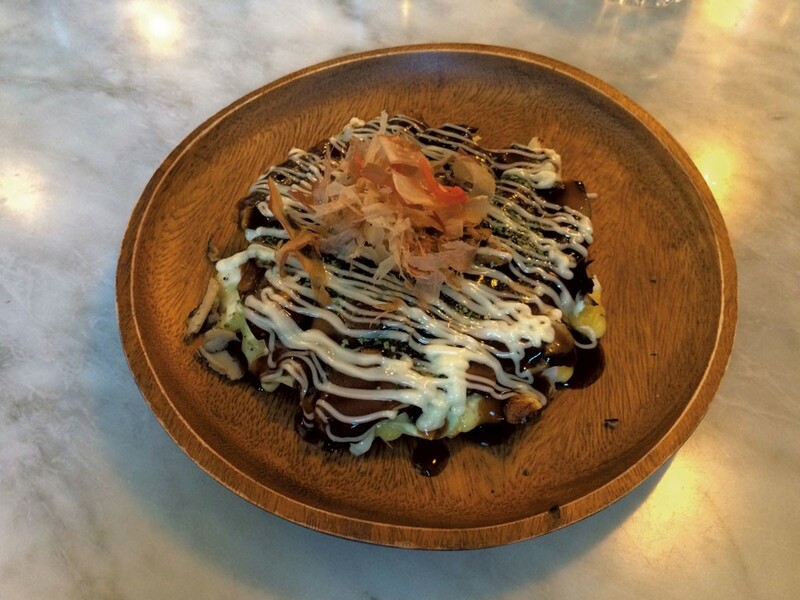 The okonomiyaki ($10-11), described on the menu as an omelette, resembles a vegetable-laden savory pancake. Its main ingredient is thinly sliced green cabbage, held together with egg. We ordered one with shiitake mushrooms, which gave a meaty earthiness to the dish. The other okonomiyaki came with bits of pork and cheese. Each was drizzled with a slightly sweet soy sauce glaze, lots of mayo and more bonito flakes. Both were rich and filling, though the texture of the shiitake version was especially pleasing. 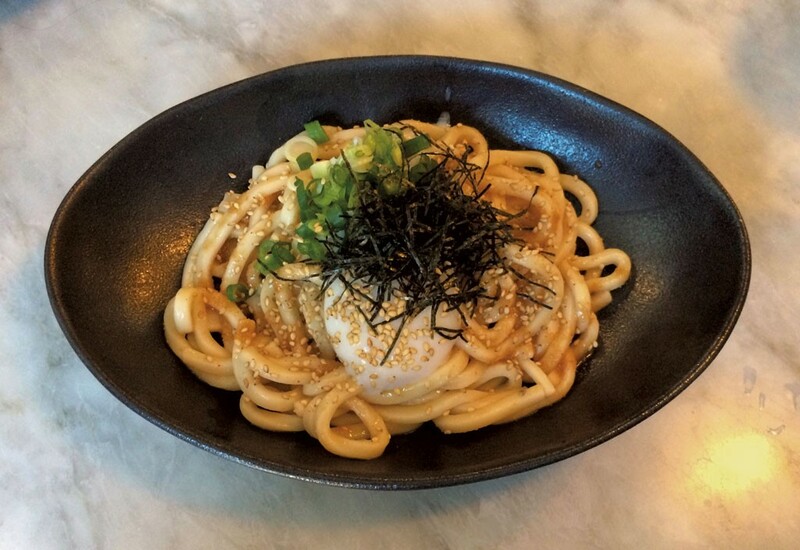 The plate of the week, hiyashi mentai udon ($13), consisted of thick udon noodles and a poached egg with a sauce of roasted sesame oil and tiny cod eggs. Topped with dried seaweed, it was served cool, a refreshing option during the August heat wave. Curiously, our two orders tasted slightly different, one a bit spicier and more acidic, but both went well with a glass of organic mutemuka sake ($10). Served chilled, it was smooth with a subtle umami flavor. Noren is conducive to cozy conversation with fellow diners. We marveled at a neighbor's double-screened flip phone that expanded to eight inches long when opened. She'd bought the phone in Japan, she said, and lamented that it was no longer available. Later in the meal, a distressed mother exclaimed that her elementary school-age daughter had downed her parents' sake, thinking it was water. The parents were relaxed enough to shake their heads laughingly with us and the staff, then got back to eating with their youngster, who appeared unfazed. The ice cream with cherry sauce was sold out, so we finished the meal with a fruity drink, mii no umeshu ($10). Made by steeping plums in aged sake, the umeshu was orange hued and smelled of sweet almonds. Served over ice, it was sweet, slightly tart, savory, funky and exceptionally balanced. Greedily, we asked about buying a bottle to take home, but the employee said the umeshu was from a private importer, and we'd finished the restaurant's last bottle until the next shipment in October. Despite the lines, the bustle and the constant worker multitasking, Noren retains an atmosphere of function and ease. All parts of the space seem to be used with intention; the dry goods and workers' personal belongings are stored above the kitchen ceiling in an area accessed by a ladder between the kitchen and bathroom. Just below the wall menu hangs a vintage TV hooked to a first-generation Nintendo on which Tsuda played as a child. It still works, and customers are welcome to play on it. Noren is a restaurant that knows how to handle its popularity, one that neither succumbs to the potential stress of lines of hungry people nor cultivates an air of lofty indifference to the ever-present crowds. Lamarre said the restaurateurs have no plans to expand, change their model or augment their hours. Cheers to an uncompromising restaurant with satisfied workers, well-sourced ingredients and affordable, crave-worthy meals. The original print version of this article was headlined "Crispy, Creamy, Salty, Savory"